“Wow. You’ve done an amazing job there! I can’t believe how well he’s come up! You’re a genius.” Richard has brought back to life some old 19th century Japanese glass negatives as well as old family photos- tough restoration jobs. He listens to what I need and then draws upon his own artistic experience to make it even better. Fantastic work on some very old and deteriorated photos. Not only were they restored to a really high standard well beyond our expectations, but the frames were cleaned and mounts added to provide beautiful pictures which now adorn our walls. Highly recommended. Richard Haines somehow managed to transform a badly damaged photograph of my maternal grandfather into a full image – even though the poor digital copy I sent him was covered with very noticeable lines & creases. How Richard did it is a mystery for which both I and my grandfather are immensely grateful. Richard’s work, and that of his company Photographs Forever, is of a high professional standard and I would personally recommend him to those who, like me, have old photos of family members or ancestors which could do with some care and attention. Amazing restoration ! Once again, I’m gob-smacked! Absolutely brilliant. I’m so very pleased by your service and correspondence. The photo is excellent quality who would have known this could be done. At last I meet my grandma and granddad. I think you have done a remarkable job with my photographs. Please accept my wholehearted thanks for a job extremely well done. I shall certainly be recommending you to all my friends. Hello Richard, just to let you know I have just received the photo, and may I say you have done a WONDERFUL!! job, congrtatulations to you, seeing that the original photo was in such a bad state I’m very happy with the restored one, now im going to buy a nice frame for it. I will be in touch again soon as my wife has some of her family photos to be restored. Again Richard thank you very much. Richard has done a brilliant and professional job, I was pleased he didn’t expect any payment until I was happy with the restoration work, as soon as I saw what he had been able to do with photographs approx one hundred years old, I was very impressed and put in an order for some prints, these arrived promptly and professionally packaged. I am very pleased to have noticed this advertisement and hopefully other Ancestry members will make use of his services. Hi Richard, thank you I have received the pic and am over the moon with it. Hello Richard, thank you so much for the photos. They are absolutely stunning! I’m delighted. My partner didn’t know what I was up to and it actually brought tears to his eyes when he saw them! The photograph arrived today and I am absolutely delighted with the restoration. Thank you very much, the photograph is beautiful and I am sure will bring enormous pleasure to my mum. I can’t wait for her to open her present , she will really love it. You’ve done it yet again – I can’t believe the clarity, particularly with the restored photograph from the faded coloured photograph that was stuck in the frame. I just wanted to say a big thank you for the super restoration of my mothers picture. I am sure she will love it! I’ll be in touch in the new year for the next project. Hi Richard, I only have total respect for you sir, well done my dear friend. Who is going to have a loving wife at Christmas, you guessed it, little old me! That looks brilliant! A good idea to go with the black and white option – much more detail now. I think she will really enjoy that. Once again, thanks for that, it really does look great. I thought this wonderful photograph of my husband and daughter was lost forever. Many thanks Richard. The restored photo is brilliant, I could not have hoped for a better result. Once again thank you for all your help. Richard, these pictures are wonderful, they are stunning and I was taken aback at the rush of excitement they gave me. Many thanks for the time and attention. I have been getting the monthly magazine for Who Do You Think You Are? (WDYTYA) since 2008, every one interesting and full of useful information. I am sending some material to them this weekend and will take the opportunity to mention you and how pleased I am with your work, especially with damaged photos. I would just like to say how pleased I was to find the Photographs Forever restoration service. I contacted Richard Haines about 2 very special, but damaged photos of my long lost father and he was very helpful. I sent the photos off to him and within a few days they were restored. He kept in constant contact by email and let me see proofs before any decision about buying the restored jpegs or prints had to be made. I found him to be most helpful and professional. The prices are fair considering the amount of time it can take to alter a photo. Also you don’t have to buy the finished product if your are not happy with it. I would have no hesitation in recommending his services to anyone. I keep meaning to have a thorough rummage through our old photos – hopefully I’ll get the time in the New Year. Your restoration work is second to none! I’m sure I have a few more photos that would benefit from an ‘overhaul’ so my new year resolution is to look them out and do something about them! The photo you restored is now professionally framed and wrapped as a Christmas present – it looks beautiful! Wow, she looks amazing in the restored photograph. I felt very emotional looking at her – for the first time really, you have done an incredible job. Thank you so much for the restored photograph which arrived yesterday. I am delighted with it. I have sent one copy to my sister in Wales and I know she will also be pleased with it. I won’t hesitate to call on you in the future.Very many thanks again. It’s amazing how much detail you have been able to uncover. Very impressive. Thank you once again for your work, I am very pleased with the result. I can now show the image to some military experts to see what they can make of the details which have been uncovered. That’s a really excellent result – well done! I’m very impressed. Many thanks for your prompt service. Received the restored jpeg you have just sent – opened and download with no problems at all. Looks really good and I will be posting the picture on my Facebook pages, along with a recommendation for my friends and family to get in touch with your website for any of their photos/negatives they need sorting out. Also thank you for the receipted invoice and I will definitely send a message to the Ancestry support team about the excellent service I have received from you, with an almost impossible project to sort out for me and the great results you have provided. No doubt I will be back in touch with you again Richard, regarding more photo restoration, but for now thanks again and all best wishes for the future. I would just like to say how impressed I am with the photo you restored for me. I would recommend your services to others and if I have any other photos that need restoring, I will be sending them to you. Oh what a delight, I wish I had ‘done something’ about the picture before! The task was demanding, but Photographs Forever response was great. Quick, constructive, helpful and at very reasonable cost (with “NO SATISFACTION NO CHARGE”). Richard helped me though the technicalities of transferring large files on-line,and despite my enquiry only being to try to repair and enhance one of the images, Richard suggested how the better parts of each could be edited into a better composite and repaired , so that the end result was more than I had hoped for, and a fitting memoir for my family record. I can definitely commend Photographs Forever to other Ancestry.co.uk members. Discovered this business at a very useful time and have not been disappointed. 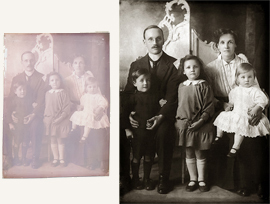 An old family album that could not be split was beautifully restored and enabled all the family to be able to share it. I would strongly recommend them for all photographic work – old and new! The enlargements are brilliant. I’m really pleased with them and very grateful to you for what you have been able to do with the original. Wow! Is your middle name “genius” ? The restored photos are brill.Many, many thanks Richard. Your service was very good in every way. To speak personally on the issues is good, reassuring when sending precious items to the unknown. Excellent restoration of old 35mm slides and conversion to digital format. I loaded them on to my iPod and took them to a 30 year reunion. My old uni friends were amazed by the quality and also how young we looked once. Many thanks, they have come up much better than I though they would. Just seen the restored photographs Richard – they are truly incredible. Absolutely brilliant. Thank you. What a fantastic thing you are doing! The improvements in images are remarkable! I not sure if the original is worth having back seeing as you have done such a great job in restoring it. Thanks for doing this I really appreciate it. Richard – What a fantastic restoration! Congratulations and keep up the good work! We have been completely satisfied with your service and went ahead because your web site was the best of three we looked at. We are 110% pleased with the photograph especially as it is nearly seventy years old, also we thought your price was good value for the results achieved. I was so impressed with the work carried out by Richard. I didn’t think it was possible to restore such an old, tatty photograph to such a high standard. I would highly recommend Photographs Forever if you are looking to have your precious photos restored, so they can continue to be handed down generation after generation. Excellent, prompt service but not at a sacrifice to the quality. Superb service and attention to detail. Highly recommended. I was absolutely delighted with the photograph that Photographs Forever restored for me. It was one of only a few photos that remained of my late mother, and she was partly obscured in the picture, which was itself 30 years old and of fairly indifferent quality. I now have a lovely full-sized portrait of my mother which does her memory justice, in time to remember her on the 30th anniversary of her untimely passing. I prefer not to upload the picture itself as it is quite a personal thing, but please be assured that Photographs Forever did a wonderful job. Although this is less important to me, the work was also carried out extremely quickly, but most importantly, I was consulted all the way to make sure I was happy with the work as it progressed, and I also felt that they appreciated the significance and sensitivity of the task. Brilliant job well done. I wouldn’t have believed such restoration would be possible if I hadn’t seen it with my own eyes. Great service and value for money.